"The Emerging Trends - Paris Designer Spotlight: Christine Manthey"
Beginning her career in the industry as a technical designer for various glorified brands, Christine Manthey started her collection, MANTHEY, in the Fall of 2009 with a unique eye for design. Manthey is excited to show off her new designs and get back to her “full creative roots as a designer”, she says. We are looking for female models with runway experience (with at least 5 non club runway show experience) that want to take part in an International Fashion show outside of NYC (about 2.5 hours away). The show is on the 29th of September. You will be required for the 28th and 29th (full day). We are seeking a savvy and elite group of up-and-coming designers to showcase women's style and trend. The designers will be chosen based on their creativity, experience, and distinctiveness. Contestants will have the opportunity to showcase their never before seen work in front of judges, media, and fashion professionals. This is your chance to gain instant exposure among the global fashion industries elite. Throughout his nearly fifty years on the big screen, James Bond has proven time and time again that his debonaire charm and cutthroat skills are irresistible to any woman who comes across him. The Emerging Trends 2011 - Boston Platinum Runway Presentation from The SYNERGY Events on Vimeo. Boston Fashion Night, April 30th, 2011 from synergy on Vimeo. Bond Girls’ Signature Looks – Ready to dress up like a movie star? With the arrival of SYNERGY’s 007-themed New Year’s Eve party approaching, soon a question on everyone’s mind will be “What to wear?” With the help of the famous women in the James Bond series, everyone can enjoy a bit of danger and glamour. 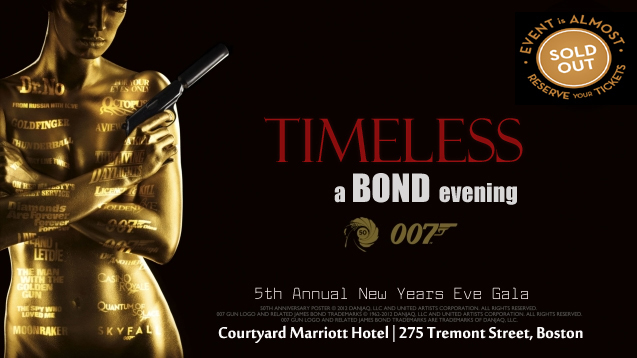 Boston's Upscale New Years Eve Party Timeless – A Bond Evening!